The McMaster Biochemistry and Biomedical Sciences Society and McMaster Biomedical Discovery & Commercialization Society are beyond excited to present you with the event of the year that you will not want to miss. Get ready for an amazing night with great food, music and fun! The formal will be held at Carmen’s Banquet Hall on January 25th, 2019 from 6:30 PM - 11:30 PM. Gather your dresses, suits, bow ties and pipettes and join us for a classy night at Carmen's Banquet Hall, which will include a delicious 3 course meal accompanied by raffle prizes, great music and dancing. Join us for a formal like never before! Even if you’re not in Biochem or BDC, this night is for anyone to enjoy! For $35, you’ll get: Transportation to the venue and back to McMaster, 3-course meal, great music and dancing. Visit our Facebook Event Page for more information. Buy your tickets online here. Inviting all biochemistry students to our annual Welcome Social at Stevie D’s. Perfect opportunity to meet your Brotein mentor/mentee and bond over some pool. Free Pizza! Come come come! There will be BBSS guides for buses at 6:10, 6:30, and 6:45 in front of the health sciences building/library if you wish to tag along with them! Design a long sleeve and send an image to fundraising@macbiochemsociety.com by 5 PM on September 24th for a chance to win a $25 Campus Store gift card and a free shirt with your design. Only appropriate designs will be considered. Be creative and have fun! Thinking about Specializing into Biochemistry? Check out this useful infographic for some more information on the Biochemistry program! BBSS Sports & Trivia Night! Congratulations on finishing up the year! To celebrate, the BBSS is hosting two amazing events on Thursday, April 5th! Brotein mentors will be around to give you tips and tricks on how to impress the ever-feared Marking Mentor® who has been assigned to have a look at your grant proposal. 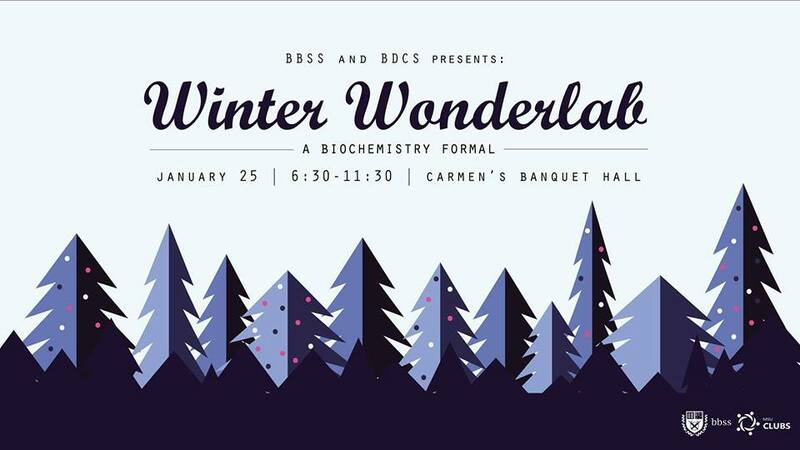 “A Night at the Operon” formal is the Biochemistry and Biomedical Sciences event of the year. The McMaster Biochemistry and Biomedical Sciences Society and McMaster Biomedical Discovery & Commercialization Society are beyond excited to unite to make A Night at the Operon a night to remember. Come to Thesis & Research Night to hear about what supervisors look for, how to apply, and have the opportunity to ask questions and receive tips and tricks. Attention all second year biochemistry students! The proposal report due date is fast approaching and it's time to get those reports done (or at least start sometime soon). We're back for Round 2 of Biochem 2B03 midterm review sessions! Let Brotein mentors guide you and answer your questions about the second BIOCHEM 2B03 midterm. Come eat snacks with us while we get to know the material inside and out. etwork with professors and explore their research at Meet the Profs Night — an event hosted by the McMaster Biochemistry and Biomedical Sciences Society in collaboration with the Biomedical Discovery and Commercialization Society. Your degree can pave the way for a unique career, but at this point in your life, how can you be sure of what you want to do with it? Listen to some amazing people talk about what they did with their biomedical sciences degree and have the opportunity to learn more about where your degree can lead you. Let Brotein mentors guide you and answer your questions about the first BIOCHEM 2B03 midterm. It's time for all you biochemists to show your creative sides! The BBSS has opened a logo design contest where we are looking for your designs. Brotein mentors will be around to give you tips and tricks on how to impress the ever-feared Marking Mentor® who has been assigned to have a look at your proposal. Check out the highlights of the night. Speakers from the fields of biochemistry, biomedical sciences, and commercialization will share their perspectives on the variety of careers related to each discipline.